Drones: A fresh look at marine classification surveys. An emerging technology, unmanned aerial vehicles (UAVs) are already changing how ships, offshore assets and onshore infrastructures are inspected. Better known as drones, they promise to save time and costs, for instance in marine classification, by reducing survey preparation, reducing the need for scaffolding and rafting, and avoiding damage to tank coatings. Most importantly, they improve safety, since surveyors do not have to work at height or, in some cases, confined spaces. We have been working with aerial, ground-based and underwater robotic systems for decades. As well as exploring the technology, we have been at the forefront of developing service supplier approval procedures, trial programmes and criteria, policies and guidelines for using drones, UAVs and other remote inspection techniques safely and with due regard to the end product, the results. Risk management is at the heart of our business. So we have produced guidelines to help avoid drones themselves introducing new risks into marine and offshore environments and have been involved with surveying projects around the world; working with UAV operators, academics, technology companies, regulatory authorities, industry bodies and our own clients. Additionally, recognising the limitations of some of the systems on offer in the marine and offshore areas, we have now developed a standard for the assessment of Remote Inspection Techniques, ensuring that the systems used are fit for purpose and are qualified for defect detection. Our experts can give advice on how UAVs can work for you as we have seen and assessed a huge variety of UAVs and service suppliers. In our experience, there’s a world of difference between drone operators who offer inspection services and inspection specialists who use drones as part of the process. We can evaluate your potential UAV supplier and advise on the suitability of their equipment, skills and knowledge in terms of meeting your particular survey and inspection requirements, and ensure they comply with relevant standards. The capabilities of drones are developing all the time but there is still work to do - and we are closely involved with all of it. We have been involved in almost 50 remote surveying projects around the world, working with UAV operators, academics, technology companies, regulatory authorities, industry bodies and our own clients. Drawing on this unique experience and expertise, we can evaluate your potential UAV supplier and advise on the suitability of their equipment, skills and knowledge in terms of meeting your particular survey and inspection requirements, and ensure they comply with relevant standards. We have published Guidance Notes for inspection using Unmanned Aircraft Systems, helping you apply a consistent approach to risk, regulations, personnel, quality, safety, hardware, software and operations when conducting visual inspections using UAVs. We also have a certification process to qualify innovative technologies or mature technologies that have an element of inherent novelty, ensuring that the accompanying technical risks are reduced to an acceptable level of tolerance. The capabilities of RIT equipment, the RIT Systems (RITS), have been developing rapidly in many areas, including navigation, data collection, data analytics, and automation. LR has actively engaged with clients and vendors in the use of RITS on surveys and in the development of the equipment. To date, much of the focus of the industry has been on whether the RITS can access and navigate the survey areas. However, this is a step towards the primary reason for undertaking an inspection or survey, which is to confirm whether or not the structure contains defects, such as corrosion, cracking, buckling, or coating breakdown. Therefore, the fundamental question that LR asks when considering the use of a RITS to support a survey is ‘Is it actually capable of finding defects?’. 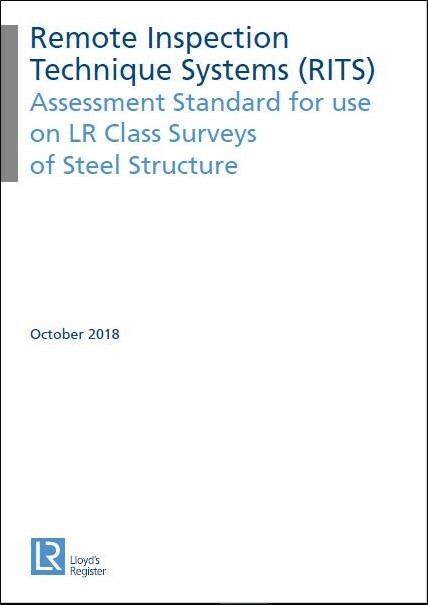 To help answer this question and to move the focus of engagement onto this core issue, LR has launched its standard for assessing the capability of RITS. This standard has been prepared following extensive engagement with clients, inspection companies, and equipment manufacturers. It is aimed at all parties engaged in the development of, and in the use of, remote inspection techniques. Click on the image below to download the document.